The proverbial buracratic bottleneck. Yes ladies and gents, I found myself smack dab in between those immovable walls, with no place to go, and then BAP! The aforementioned is a recap of the previous week, and the challenges of attempting to install a large-scale sculpture in a public space. From public art board, to the Parks Department, to supervisors, and then administrators and then back to another board, I felt like a ping pong ball, richocheting off a ubiquitous wall of higher power. Then Wayne Kackela, long time resident of Steamboat Springs and my fellow Art Buddy assisted me in finding a privately owned business to display my large-scale sculpture. 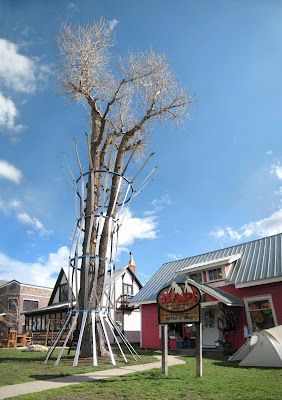 We landed in front of BAP, or Bwear Action Products, where the I cajoled with Bill Gamber, the owner and former Ironman Triathlete, for a period of 2 minutes before he granted me permission to use his tree for my sculptural endeavor. One note of hilarity are the archery targets. Made of dense foam, these assorted mountain lions, pigs, elk, and antelope were recently mauled by a bear. The fake animals were attacked viciously on their throats, hamstrings and other crucial areas. The remedy - Great Stuff! an expanding foam which can be carved down and painted. The result- animals bandaged like impromptu patients to help contain the voracious foam. Stay tuned for the next episode of this adventure, "The scraggly tree gets a corset!"